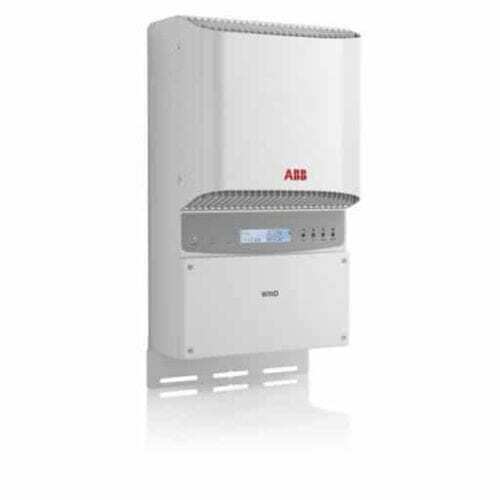 The ABB PVI-3.0-TL-OUT-W 3kW Wind Inverter is designed with ABB’s proven high performance technology. This dual stage transformerless wind turbine inverter offers a unique combination of high efficiency, installer-friendly design and very wide input voltage range ensuring high energy harvesting. The high speed and precise power curve tracking algorithm allows to best match the power curve of each turbine. The ABB PVI-3.0-TL-OUT-W 3kW Wind Inverter features an efficiency up to 96.8 percent thanks to transformerless technology. It has power curve customization with high granularity, up to 16-point, for high production yield. It is a sealed unit to withstand harsh environmental conditions. ABB (ASEA Brown Boveri) is a Swedish-Swiss multinational corporation headquartered in Zürich, Switzerland, operating mainly in robotics and the power and automation technology areas. It ranked 286th in the Fortune Global 500 list (2016). The corporation is one of the largest engineering companies as well as one of the largest conglomerates in the world. ABB has operations in around 100 countries, with approximately 132,000 employees in December 2016. ABB is traded on the SIX Swiss Exchange in Zürich, Nasdaq Stockholm and the New York Stock Exchange in the United States. The company provides the most comprehensive portfolio of products, systems, solutions and services along the solar PV value chain that enable the generation, transmission and distribution of solar power for grid-connected and microgrid applications. Our offering includes inverters, low-voltage products, monitoring and control systems, grid connection, stabilization and integration products, as well as complete electrical balance of plant solutions. ABB also offers a wide range of support and maintenance services, including remote operations and diagnostics, helping ensure solar installations deliver optimal performance. Join our ZERO Home Bills Community. BEST Products from the BEST Brands at the BEST Prices for ZERO Home Bills on ZEROhomebills.com by Solaranna. ABB (ASEA Brown Boveri) is a Swedish-Swiss multinational corporation headquartered in Zürich, Switzerland, operating mainly in robotics and the power and automation technology areas. It ranked 286th in the Fortune Global 500 list (2016). ABB is one of the largest engineering companies as well as one of the largest conglomerates in the world. ABB has operations in around 100 countries, with approximately 132,000 employees in December 2016. ABB is traded on the SIX Swiss Exchange in Zürich, Nasdaq Stockholm and the New York Stock Exchange in the United States. ABB provides the most comprehensive portfolio of products, systems, solutions and services along the solar PV value chain that enable the generation, transmission and distribution of solar power for grid-connected and microgrid applications. Our offering includes inverters, low-voltage products, monitoring and control systems, grid connection, stabilization and integration products, as well as complete electrical balance of plant solutions. ABB also offers a wide range of support and maintenance services, including remote operations and diagnostics, helping ensure solar installations deliver optimal performance. Join our ZERO Home Bills Community. BEST Products from the BEST Brands at the BEST Prices for ZERO Home Bills on ZEROhomebills.com by Solaranna. Rating: 1,200 W Phases: 1 ONLY TWO pcs in stock!